More than 22 months after a Cuyahoga County grand jury unsealed an indictment in the Oakhill Renaissance Place criminal-corruption case, we’ve finally come to the trial. The case centers on an alleged conspiracy between some Mahoning County officials and Anthony Cafaro Sr., a prominent businessman, to stop the 2007 relocation of a Mahoning County agency from a building owned by Cafaro’s company to the county-owned Oakhill. Filed by the state of Ohio against the following people and businesses, showing their purported involvement with other members of the enterprise. Was organizer and leader of the public officials. Charges: Breached the sanctity of confidentiality to obstruct Mahoning County from purchasing a building by divulging material to Anthony Cafaro Sr. or his attorneys. Tampering with records, lying under oath in a lawsuit. Accepted money and services from Cafaro Sr. and/or Cafaro Co. in the course of his duties as county commissioner. Committed theft in office. Filed false ethics reports, and committed other crimes to conceal conduct. Recruited officials, Cafaro Sr. and others who provided benefits to Yavorcik to run for Mahoning County prosecutor so that, if elected, he could stop any investigation into wrongdoing committed by members of the enterprise. Charges: Made false statements in legal proceedings. Accepted money and services from Cafaro Sr. and/or Cafaro Co. for performance of his duties as county auditor. Provided services and benefits to Yavorcik so that, if elected, he could stop any investigation into wrongdoing committed by members of the enterprise. Filed false ethics disclosure forms. Charges: Accepted benefits (money and services) from Lisa Antonini, Cafaro Sr., Sciortino, McNally, John Reardon and others so that if he was elected, he would not investigate or prosecute any members of the enterprise. Character letters to Judge Janet R. Burnside on behalf of John McNally IV and Michael Sciortino in regards to the Oakhill case. Judge's journal entries in Oakhill case no. CR-14-585428-C, The State of Ohio vs. Martin Yavorcik. Old technology outhouses would be a viable solution. McNally and Sciortino took plea agreements McNally accepted a plea to four misdemeanors: two counts of falsification and one count each of unlawful use of a telecommunications device and attempted unlawful influence of a public official. Sciortino took a deal to a felony count of having an unlawful interest in a public contract, originally tampering with records, as well as misdemeanors of falsification and receiving or soliciting improper compensation. He is also prohibited from holding a public office for seven years. Yavorcik provides a 24-page document from prosecutors given to him before his indictment outlining the prosecutors’ case against him. The judge agrees to let Yavorcik, an attorney since 1999, defend himself. At the request of Judge Burnside, prosecutors reduce the number of counts against the three defendants to 53. Prosecutors say it keeps the strongest charges in the indictment. Defendants file their list of 68 potential witnesses. The first public pretrial hearing in the case includes the revelation that Youngstown political consultant Harry Strabala admitted he secretly recorded Mahoning Valley politicians. Prosecutors indict Sciortino in Mahoning County on 25 felonies: 21 counts of unauthorized use of property - computer or telecommunication property - and 4 counts of theft in office. He is accused of illegally using government-owned computers and software more than 300 time to raise money for political purposes to keep him in office, and for directing three of his employees to assist him. He pleads not guilty. A 100-page “notice of intent to use evidence” is filed by prosecutors that provides further details on the alleged crimes committed by the defendants. Sciortino is defeated by Republican Ralph Meacham in a re-election bid. Sciortino’s term ends Feb. 23, 13 days before it was to officially end, with a three-member panel of retired judge remove him early from office. He spent those final days on paid suspension. A 145-page bill of particulars is filed by prosecutors that outline the specific charges against the three defendants. The three defendants plead not guilty to the charges. Ohio Attorney General Mike DeWine and Cuyahoga County Prosecutor Timothy McGinty announced a 83-count indictment against Youngstown Mayor John A. McNally, then-Mahoning County Auditor Michael Sciortino and attorney Marty Yavorcik. The charges include engaging in a pattern of corrupt activity, bribery, perjury, conspiracy, money laundering and tampering with records. A visiting judge dismisses a 73-count indictment without prejudice, meaning the charges could be refiled later. The case was dismissed by prosecutors because of their inability to obtain tape recordings from the FBI and provide them to the defense making it impossible to proceed. The grand jury returns a 73-count indictment charging seven people and three organizations with multiple felony and misdemeanor charges related to the relocation of the county’s Job and Family Services offices from Garland Plaza to Oakhill Renaissance Place. A Mahoning County grand jury hears testimony and examines documents on Oakhill in at least 12 sessions with the special prosecutors, concluding its work this week. The grand jury, which was scheduled for a four-month session ending April 30, was extended twice at the request of the special prosecutors, but the county’s common pleas judges said the extension ending this week would be the final extension. The county moves its Veterans’ Service Commission from its Southside Annex to Oakhill. At the request of Mahoning County Prosecutor Paul J. 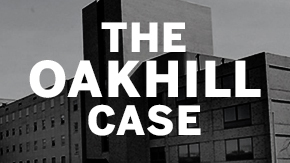 Gains, the county common pleas judges appoint Dennis P. Will and Paul M. Nick as special prosecutors to probe potential criminal conflict of interest related to the purchase of Oakhill. The County buys Oakhill in U.S. Bankruptcy Court and keeps the city health department and coroner’s office there, but assumes responsibility for more than $900,000 worth of mortgages and liens, including a $430,000 Ohio Department of Development loan to SCDC and a real estate tax bill of about $400,000.